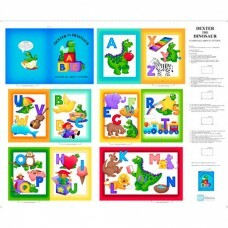 Price per panel -Bright book panel with full printed construction instructions to make a baby's book..
Panel measuring 60 cm x 110cm (across full width of fabric) made up of 6 large cute, bright dinosaur..
Dinosaurs in 12.5 cm squares in rich green foliage setting. Royal blur borders. 30 cm repeat..
60 cm wide panel x full width of fabric - 110 cm 2 small squares approx. 22 cm x 22 cm at the top an..
Panel in black white and greys . Size 110 cm x 110 cm.. Pastel coloured bubbles on soft blue . Panel 110 cm x 110 cm.. Bubble panel in blue tones with white. Panel size 110 cm x 110 cm..
Pillow size picture panel with repeat of 4 different cute cat pictures each approx. ..
Panel size 90 cm x 110cm or 36" x 42" Price per panel. Pretty flowers and butterflies surround..
A pretty garden scene featuring pastel pink and orange roses and Peonies in the foreground of&n..
8 squares approx. 9" x 9" digitally printed with black surround. Featuring Azaleas, Daisies, Violas,..
Large panel 110 cm wide x 90 cm high -underwater scene with large shark dominating -colourful coral ..
Large hydrangea blooms in soft blues, lilac, mauve on pale sky blue background. Width 60 cm or 24".. 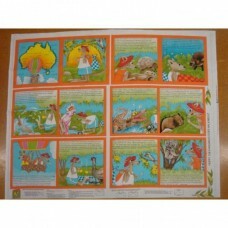 Accurate digitally printed 42" x 36" panel..
Full instructions printed on panel to make into a soft book. Hoppy the kangaroo goes walkabout..